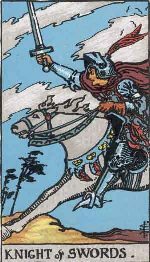 The Knight of Swords card indicates an intelligent, subtle and sharp-witted person. He is usually an intuitive, perceptive, logical and an abstract thinker. He has an elusive and ethereal nature with a strong and attractive personality that is hard to resist. He can attract any person like magnet attracts iron filings. He can switch his charm on and off whenever he likes. In that case you would not notice him even if he passes by you. 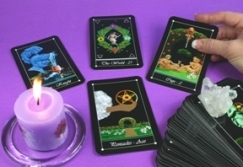 Since he has an inquisitive and analytical nature, he is often involved in paranormal and spiritual pursuits. He does not show off his knowledge. Those who wish to learn from him must cajole and coax him to take them under his tutelage. Sometimes, this card reveals an angry person who has been deeply wronged or emotionally hurt and is, therefore, out to seek revenge against the wrong doer. The Knight represents the dominant man. In divination, a forceful man who tends to bend to other to his will. He is a good friend but a dangerous opposition. 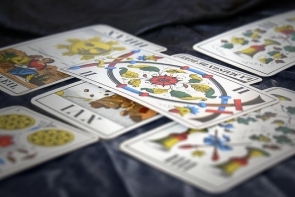 More often, the card indicates that it is your personality which is involved, or will play a major role in the matter that is being inquired about.